I usually find myself in the mix of protesters and organizers, marching in the streets during this time of year. 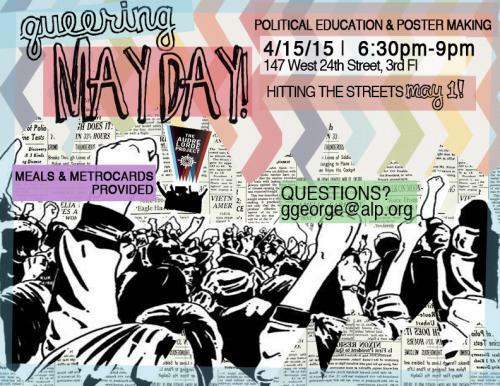 I’m talking about Mayday or as it’s known worldwide: International Labor Day. Mayday is our chance to celebrate all the great things white men have done in history! But we also know white men who were just like other groups in history. They worked hard, they tried to make a decent living. In college I had a professor who lost half of his leg working on the Ports of New York City, as a longshoreman. His father and grandfather, and he says- ‘every father before that’ had been longshoremen. He was also a union organizer, and proud of it. Our generation definitely has it worse than his. But here we are, the 2015 graduation season. The best and worst of times. I had them too. Worries and doubts. The sense of dread as I filled out job applications and fielded questions about what I’d do after college. I ended up doing a year of service, with New York City Civic Corps. But after the term was up I realized….a college education, pride in your work, a career trajectory: those are all privileges. I enjoyed the work that I was doing, but I was still searching for ways to truly make a difference. It seems the worst part about graduating from college into the real world, is never really getting a hold on that same sense of accomplishment everyone else seems to have. I decided to write The World Without Racism because I knew that I wanted to accomplish one thing overall: no more racism in my lifetime. What I’d learned in college is that white guys need to have a healthy sense of pride too. International Labor Day is important, it’s the one day we stand up for the little man: black, white, yellow and brown. It’s warm outside, so we take to the streets. We have rights to fight for, so we take them. It didn’t always used to be that way. And all because of some white guys rioting, looting, and burning their neighborhoods down, So for Mayday I’m celebrating the unions and the white guys. Cheers to the ones who work hard just to not be beaten down.